peek >> << backNorthwest corner of Half and N, May 2003. 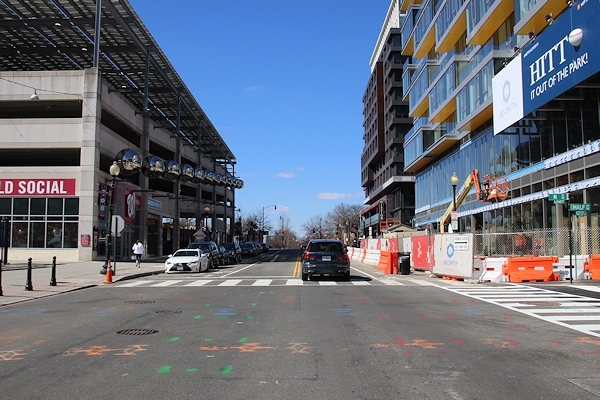 March 17, 2019 - The state of construction as seen from N Street. March 17, 2019 - Looking southward along Half toward the ballpark shows the building's very unique "funnel" design, and also the proximity to Nats Park. July 8, 2018 - The West Half project as seen from Nationals Park's Red Loft. It's kind of close. 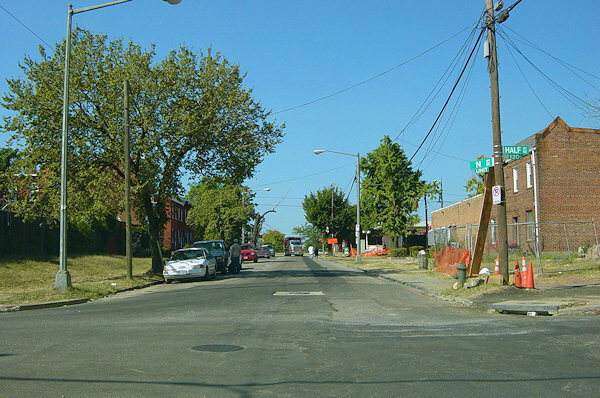 Looking west on N Street at Half, where the West Half project rises at right. And, to the left? Slide to find out. January 2006 - The northwest corner of Half and N, the same as the above rendering, but back when it was home to the Good and Plenty Carry Out. And the empty lot seen between the two rowhouses has a bit of history. March 17, 2019 - The same location, now well underway, where outdoor bar The Bullpen opened in 2009 and ran for three seasons before being folded into the Fairgrounds in 2012. Aug. 12, 2006 - Looking north on Van Street from Half Street, back in 2006. This land was originally purchsed by Monument Realty in 2005, and then bought by Akridge in 2008. March 17, 2019 - The same location, in its current state. This also gives a good indication of how far north the building stretches. A look at the residential building Akridge had planned for this southern end of the block, before it sold the property to JBG in 2015. Another rendering from the Akridge era, showing at left the office building it had planned where the northern end of JBG's residential building will now be. At right is an earlier version of the still-planned office building at 25 M Street, now being developed by Brandywine REIT with Akridge. October, A Good Time to Look at Skeletons. And Holes. And Buildings.